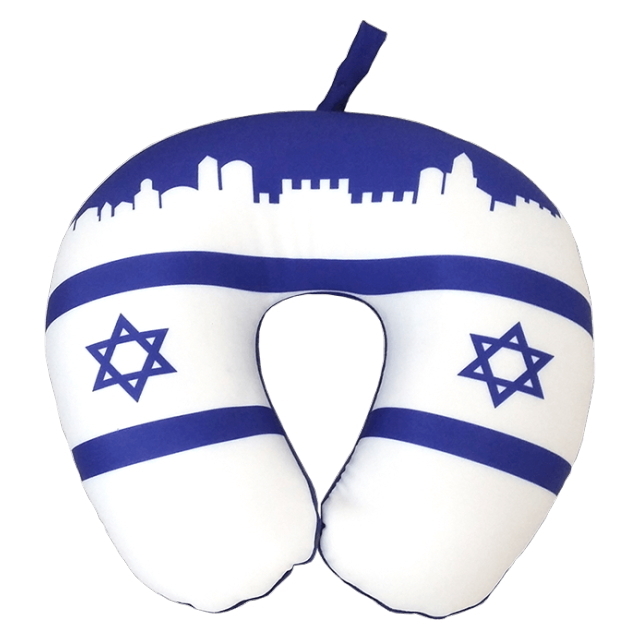 Whether on your next trip to Israel or just a trip to the next town, this Israel travel pillow makes a great travel mate. Designed with the motif of the Israel Flag and the Jerusalem skyline and made from comfortable fabric and ergonomically designed to fit your neck and provide support to the neck in an upright position, giving you maximum comfort. It is excellent for sleeping on planes, cars, buses, trains on long and short journeys. It is also ideal for relaxing at home while watching TV or reading, anywhere you need upright neck support and alignment. The bottom of this neck pillow is plush and the top with the image is made from a very soft nylon. It is filled with squishy bean bag beads. The result is a highly comfortable pillow.